Sony does not fail in its effort to “mislead” the consumer with the launches of their phones. Having already established the X range as the (new) backbone of the mobile division, only a few months ago we met the new Xperia X and X Performance. A major brand season comes, just before the big shopping trends with Nokia 6, Samsung’s S series. Sony unveils its most aspiring model of the new Xperia X series. The new Sony Xperia XZ weighs most is the sensor of 23 megapixels with improvements in focus, as well as a unique design that does not admit of indifference. Will this be the year of the Xperia XZ as high reference range? Let’s check it out. The Sony Xperia XZ comes with a high-end technical features except for the panel with 1080p resolution. Regarding Xperia X Performance, there are hardly any news. As we have indicated the screen grows to the classic 5.2 inches of the reference model of the Asian company, and the battery increases its capacity slightly to 2900 mAh. The really different thing is in the design, as you will be able to check. The appearance, without renouncing the spirit of the Xperia Z and X, is modified in many points. And the resistance to water remains. The camera, without change of sensor, does incorporate novelties like the laser approach or stabilization Steady shot more complete. And the video recording jumps to the 4K supported on the combination of a powerful GPU, 820 Snapdragon processor and 3GB of RAM. Just half a year ago Sony gave the change and went on to the Xperia X. Introduced the models Xperia XA, Xperia X and the most complete-level specifications: Xperia X Performance. Since starting this line called X was something like breaking (back) with the past, Sony could have ventured into a radical evolution of design. But it was not like that. Not at least on the models prior to this Xperia XZ. In the design of the new Sony Xperia XZ is very present the idea blessed as Omni balance and that the Japanese company has been polishing every iteration but without giving up something characteristic: the straight lines at the top and bottom of the terminal. No curves at the corners, something that all other manufacturers have adopted. Luckily the maintenance of the essence of that design language is accompanied by numerous successes and improvements such as soft and rounded edges, texture and metal finishing of the rear and a premium appearance present in the union of each element of the terminal, from The 2.5D screen with the rest of the metal body, to the protections for the card tray, a rare devoted nowadays without requiring tool to extract it. The Xperia XZ does not compete with the rest of the high end (if we accept the Apple iPhone 7 Plus) to be the thinnest or lightest. It is really maintained in figures of balanced thickness and weight, which feel good and transmit robustness. Much more than when last year we met the attractive but fragile models with glass back. What we still expect to see from Sony is a greater advantage of the dimensions because with terminal height and width of minimum 5.5 inches, they are only capable of placing 5.2. It is problematic in both the lower and upper parts. In the Sony Xperia XZ there is protection against water and dust, with surname IP68 but on a smartphone actually means something like “take care but do not bathe with it”. The Qualcomm Snapdragon 820 processor accompanied by 3GB of RAM and the Adreno 530 GPU are the basis of the performance of this Sony Xperia XZ. Minimum configuration for the high range and price with which it reaches the market and that allow us to develop with ease in everything you do with the new terminal. If we add benchmarks, this Xperia achieves 2511 points in Slingshot ES 3.1 or 6942 in the PCMark Work test. In general the experience is very satisfactory, and with games like image editing, multi-tab navigation, multitasking … you have not found moments where there have been delays or doubts in the system’s fluidity. Here certainly helps the GPU part that is not especially required by the screen resolution. In the software section, Sony unveils its Xperia XZ well accompanied by Android 6.0 with its layer already veteran. Here the Japanese company has lost the opportunity to offer a very tempting purchase reason, which would have happened if the launch had arrived directly with Android 7.0. They are those details and steps that can grow a brand that needs any push. In the model there is some little amount pre-installed software. Just the Amazon applications or the AVG antivirus. Of the functions that Sony adds to the version of Android I like the Intelligent Cleaner. An advanced user may not want to use this application manager in memory and storage, but it can work in the background without having to tell you anything at all. It can be a great help for a good number of users who want the system to continue running without Worry about why this happens. The internal memory of the new Xperia XZ is 32 GB with possibility to expand it with microSD cards. As standard, the Android system already occupies more than 10 GB, so we started with about 20 GB real space to install applications or store any content. Another peculiarity of the Sony Xperia XZ design is found in the physical buttons. Here is the one dedicated to the photographic features, what a joy to keep it, the volume strangely placed in the lower half of the right side, and the start button. At the top we find the port of headphones, which at this point already must be mentioned that maintains it, and the loading port on the bottom. Here Sony gives way to USB-C. The start button hides the fingerprint reader that cannot be missing on a smartphone that you want to consider important. Unlike other manufacturers that had the power button side and passed the fingerprint reader to the back of their equipment, Sony made it grow and integrated into it. Yes, as did the brands that had that button on the front. And works. It’s fast, precise, no matter how turned you have your finger when picking it up, and it makes a lot of sense for the dimensions and ways of grabbing the terminal, at least in my case. Since they are deactivated by default, with the options of screen it is advisable to mark the possibility to activate the screen with double touch, as well as to use two presses in that start button to make jump the camera without need to unlock the terminal. In terms of contrast and maximum brightness, the IPS panel of the Xperia XZ is at the highest level of the part, and is especially prominent in multimedia playback. With this premise, outdoor visibility is very good, as well as indoors because of its low level of minimum brightness. The only interesting things on the screen of the new Sony Xperia XZ is at its color temperature. If you only look at your panel in a non-professional use, you will not notice anything strange or annoying, and it is a gap in which a good part of the consumers will not stop especially when it ceases to be something appreciable with high luminosity. But if you are looking for maximum color fidelity, you have to be fair and indicate that on paper, the Xperia XZ offers a panel that with high color temperature. The panel of the Xperia XZ sets its diagonal in the 5.2 inches that have been the usual in the Japanese flagship. And it does not give Sony more resolution than the 1080p with which seems to have found a balance, leaving the pixel density at 423 ppp. With this figure the screen looks great and is more than sharp, without pixilation of any kind. But that does not mean that when we face the competition with which you have to fight at similar prices, the Sony Xperia XZ is evident with QuadHD panels. 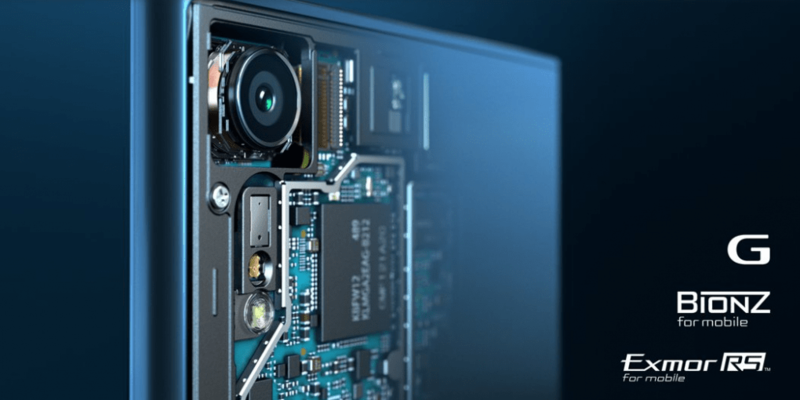 23 megapixels, large sensor (1 / 2.3 inches), physical button for the camera, a single LED flash and Sony G lenses with aperture f2.0 and angular of 24 mm. Without optical stabilization. What does the setup sound to you? Exactly, it is the same in which Sony has already insisted a couple of generations of its best handy. In the camera of Sony Xperia XZ there are six presets program to shoot, the focus is now laser (keeps track of objects) and an extra layer is added in the sensor (RGBC-IR) to help analyze the scene and get accurate white balance. With good light conditions, the general photos are very striking, with good color reproduction, accurate white balance although it has a short dynamic range that suffers especially with the intense lights. One feature that Sony knows to take advantage of is the 24mm wide angle that counts your camera. When we take photographs of natural or general scenarios, we appreciate that extra features. It seems that Sony has found a good path to work with the processing of images but still fails to reach in all situations to the best, especially in scenes in low light. There the larger sensor is not taken advantage of by the higher resolution of the same like DSLR that has a greater opening and optical stabilization that allows to collect more light. Sony Xperia XZ, as previous models of the company, does not use optical stabilization (the rest of competition itself) and is carried away by its Steady Shot, technology that Sony has been improving until reaching the 5 axes of modification of this new version. It is in the video mode when this stabilization should give the maximum. But it does in FullHD recording mode, which can be 30 or 60 fps. Does not have 4K mode the new Xperia XZ? Yes, but in a weird decision, Sony has doesn’t expose it. The Sony Xperia XZ camera is able to record 4K video but Sony has relegated the option to a menu other than the video, and also does not let the new 5-axis Steady Shot with this resolution. There we can choose whether to save the file in H.264 or H2.65, as well as whether or not to activate the stabilization of Sony, although they are support for the new dynamic 5-axis system. The good power management of Android 6.0 along with the Snapdragon 820 have suited you well to a battery that reaches 2900 mAh. Sony could have stretched more that capacity given the weight and thickness of the mobile. With long sessions of social networks, mail, some video, lots of messaging and photography, we arrived at the end of the day with more than a third remaining battery without applying any type of Energy saving mode. If we focus on users not so demanding with their smartphone, with less hours of screen and more waiting with connectivity, it is feasible that we can go to almost two days of self-sufficient using the classic Energy mode at some point. The Sony Xperia XZ has fast charging but is not exactly fast. Reaching 100% requires more than two and a half hours, something for Sony. For the Sony connection gives the jump to the USB-C port, and adds to the advantages of this type of connection for its terminals. There is no shortage of Energy mode that has meant so much for the other manufacturers to work in saving modes that we now see as common in the mid and high range. In this generation of X terminals, Sony relies on the idea of ​​battery care. If you want your smartphone to have a long lifespan, being able to lengthen that of the built-in battery is not a bad idea. The new section of Sony in its Xperia is responsible for monitoring and controlling how the battery is charged, especially if a long charge is performed at night, for example. Sony already warns that the system can only be applied when a routine is detected in the task of loading and disconnecting the terminal. If the system estimates the system, the smartphone will stop the charge when it reaches 90% and will re-activate the time just before we disconnect it from the network so that at that time 100% load is reached. Also in the part of applications there is section to decide which applications we want the system to manage to optimize the duration of the battery. And it is quite simple to handle permissions or system settings by applications. If we give it some time it will be worth it. The smartphone model with which Sony is placed end of 2016 on the same shelf as the rest of high reference ranges is the Xperia XZ. Its unique design, with a very careful and extremely pleasant finish in hand, is also water resistant. If it were thinner and with better use of the dimensions, it would have no rival. Once it has entered through the eyes, the Xperia XZ will convince whoever buys it for performance, screen quality or audio. Maximum balance without breaking element. This general target user of this Sony Xperia XZ will also appreciate the angle and resolution of the camera, and perhaps not realize that, as we approach the detail, this is not as high quality as we would wish, which makes it behind the best in the market if we have to be accurate and fair in valuation. And all this without a price that Amazon the balance in its favor.